The great writings of the past on the subject of international relations add an important dimension to the contemporary study of the field. The Theory of International Relations consists of substantial selections from authors whose ideas should be readily available to all students of international relations. All the passages selected by the editors ask fundamental, theoretical questions searching for the essence of interstate relations. 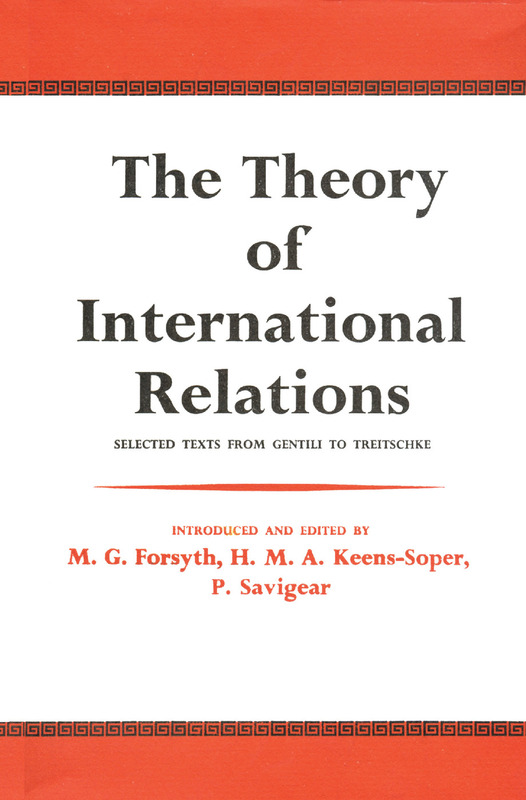 This quest for answers carries the reader into investigations of the causes of war, the balance of power, the relationship between international relations and the political theory of the state, and other major issues of this subject.The editors provide an introduction to the work, which sets out the principles of selection and their belief in the relevance of political thought to the understanding of international relations. The selections are arranged in chronological sequence from Alberico Gentili, writing in 1598, to Heinrich von Treitschke, lecturing in Berlin at the end of the nineteenth century. All are concerned with the nature of international politics. Some of these selections are translated here for the first time and others reprinted from translations not easily obtainable. It is significant that Gentz's essay on the balance of power has not appeared in English since 1806, while Rousseau's writings on international politics have never been fully translated at all.There can be little doubt that the great writers of the past are presently neglected by students of international relations. This work covers extensive ground in solving this problem. As the theoretical background of international relations is acquiring an increasingly important place in college courses in this area, the need for this book is widely felt.